Just off England’s sunny south coast lies the breathtaking Isle of Wight. With rolling green hills, sandy beaches and a charming eccentricity all of its own, this little island is a popular spot with international visitors and UK mainlanders alike. Though the island has a long list of quaint and cosy B&Bs to choose from, there are also plenty of fancier spots if you’re searching for somewhere more glamorous to hang your hat. 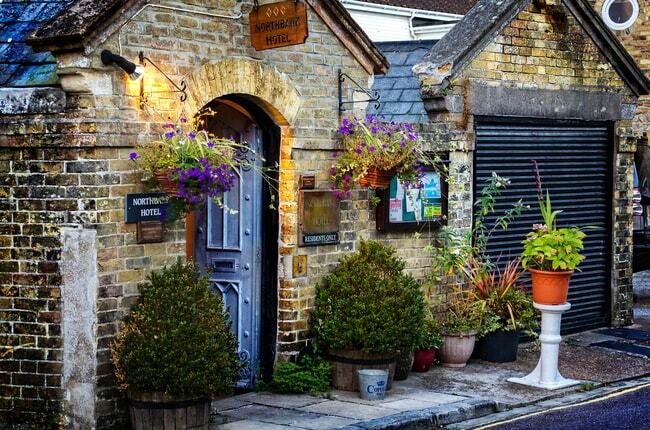 Here’s our guide to the best boutique hotels in England’s Isle of Wight. For a magical stay where your imagination can run wild, choose Woodside Bay Lodge Retreat, which offers pretty accommodation including a beautiful treehouse. Tastefully decorated and equipped with all mod-cons, this is a delightful place to call home during your stay on the island. Get back to nature from the comfort and safety of a bubbling hot tub. Sumptuous golden velvet sofas, spectacular sea views and a pretty white wrought iron pagoda are just a few of the highlights of this fabulous boutique accommodation. Standing proudly on the clifftops, the Edwardian building recently underwent a multi-million pound restoration and offers you air-conditioned, Wi-Fi-equipped rooms that still gleam with traditional luxury. Exclusively for adults, this is some five-star stuff and though it may stretch the wallet a little further than you’d like, the pay-off comes in the sheer beauty of the place. This is a good’un. If the treehouse thing didn’t excite you enough, then perhaps a night or two on this tiny floating fort will. A truly unique experience, your stay at this exclusive hotel makes a thrilling change from the traditional B&Bs we all know and love. There are 23 en suite bedrooms and, unsurprisingly, you’re guaranteed a sea view. With a hearty restaurant menu and classy cabaret acts by night, this little island (which you’ll spot on the ferry ride across from the mainland) will make you some grand memories. Back on dry land. Phew. Northbank Hotel is a marvellous place to stay, with exquisitely tasteful decor and (we know, you’ve guessed it) smashing views of the sea. Built in 1840 and passed down through generations of the same family, the building now has 18 smartly equipped guest rooms and carefully balances low-key loveliness with best-of-taste chic. These delightful huts make an ideal romantic escape from the bustle of this busy island. Snug in a wonderfully rural setting, these modern spaces are perfectly equipped to let you whip up a cooked breakfast or wine and dine your loved one at the height of luxury. Windy walks in the surrounding countryside are all the sweeter knowing you’ll soon be home to this clean and cosy retreat. There’s a hot tub here, too, to relax your tired legs after a windswept stroll on the Isle of Wight’s gorgeous sands. You’ll find St Catherine’s Lighthouse just outside the scenic hamlet of Niton and not too far from popular Ventnor (where Edward Elgar is believed to have spent his honeymoon). Choose from three former lighthouse keeper’s cottages including Landward which sleeps up to four of you. With a shared grass area for summer picnics and a real ale pub a breezy 10-minute stroll up the hill, any one of these beautiful buildings would make for a fine place to stay and, of course, to admire the postcard-perfect white lighthouse itself, which sits proudly at St Catherine’s Point. Once a part of Queen Victoria’s Osborne Estate, this beautiful period building has by no means lost its regal air. This 10-bedroom boutique hotel is a splendid choice for a chilled out getaway, complete with fancy touches like luxury bedroom suites and magnificent grounds. The picturesque gardens surrounding this classic hotel, along with its swallow-you-up mattresses and menu of delicious dinner treats, mean you can wander, eat and sleep like royalty. No one does caravanning quite like the British. In fact, does anyone else even do it at all? Shiny camper vans with blacked-out windows, yes. Super trendy VWs with 1960s flower-power print, sure. But a good, old-fashioned caravan? Not so much. This is a true taste of the summer holidays growing up in Blighty. From its dumpy silhouette to its hand-stitched curtains, a real caravan offers sheer delight unrivalled by fancier mobile homes. Vintage Vacations offers you the chance to sleep outdoors in one of these adorable vans, decorated inside to kitsch perfection. With lovely sea views and excellent facilities, this charming accommodation adds a quirky twist to your stay on the Isle of Wight. Period buildings? Check. 60-acre estate? Check. Life-changing vistas across the English Channel? We don’t really have to ask, do we? Priory Bay prides itself on being the Isle of Wight’s top country-house hotel, and that pride is not misplaced as it’s housed in a genuinely triumphant building with fabulous interiors that don’t disappoint. With high ceilings, majestic fireplaces and rooms that expertly mix design and comfort, Priory Bay helps you breathe a sigh of relief from your day-to-day and taste a little of how the classier class lives. For year-round planet-friendly glamping, try Tom’s Eco Lodge. Choose a wooden cabin, a tiny, cosy ‘eco-pod’ or a safari-style tent to sleep in, and you will be in the prime location of lovely Tapnell Farm, which is a diversified former dairy farm, also home to friendly ex-battery chickens, which have been rescued to wander and peck the gorgeous green land. Whether it’s a den twinkling with fairy lights or a deck chair by your hot tub in the sun, this super-green holiday spot is good news for you and the environment.